This week Ubisoft announced that Assassin’s Creed 3 Remastered will launch on the 29th of March 2019. The game is set to launch alongside the remaster of the initial PS Vita exclusive, Assassin’s Creed 3: Liberation. 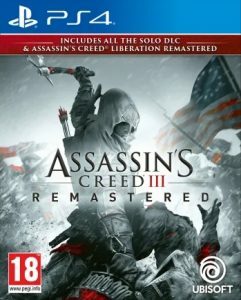 In September last year Ubisoft announced that as part of the season pass content for Assassin’s Creed Odyssey players would receive a digital copy of Assassin’s Creed 3 Remastered. They then added that the game would also release as a standalone title for anyone who didn’t own the season pass. Assassin’s Creed 3 Remastered features 4K visuals and support for HDR. Not only have textures been replaced with higher-resolution versions for current consoles, making the game look far better than it did, the controls have also been improved to better suit the gameplay and controller ergonomics. Assassin’s Creed 3 remastered comes packaged with all of the DLC which launched for the original game. This includes the Hidden Secrets mission, Benedict Arnold, and the trio of the Tyranny of King Washington expansions. The King Washington expansions were renowned for being one of the first DLCs for an Assassin’s Creed game to take true liberty with history in an alternate timeline, as well as being one of the buggiest DLCs launched by Ubisoft. Assassin’s Creed 3: Liberation Remastered will also launch on the 29th of March. The game originally launched alongside Assassin’s Creed 3 for Playstation Vita in 2012. Since then it has seen HD re-releases for Playstation 3 and Xbox 360 in 2014, and now finally it will be playable on modern consoles. When they launched both Assassin’s Creed 3 and Assassin’s Creed 3: Liberation were met with criticism that the overall formula for the series hadn’t changed much since Assassin’s Creed 2. These games saw the series branch out into new eras of history and explore new concepts within the universe. Assassin’s Creed 3 hosted several naval missions which formed the basis of the next game in the series to launch, Assassin’s Creed 4: Black Flag. While many people argued that the core gameplay was tired and repetitive, everyone agreed that these missions were a highlight, and they sparked the formula of change that has resulted in Assassin’s Creed Odyssey being what it is today.